Home / Editor's Choice, Entertainment News, Featured Articles, Gossip and Drama, News, Politics, Videos / What is going on here? Aki some of these Slay Queens, Watch this VIDEO. What is going on here? Aki some of these Slay Queens, Watch this VIDEO. 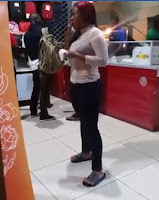 Sunday, September 2, 2018 - This slay queen was caught on camera in a restaurant behaving as if she has not eaten for weeks. She was licking everything, including the plastic paper that had wrapped the snacks. In fact, she ate even the paper that had wrapped the snacks. Some of these slay queens can be an embarrassment at times. Imagine taking such a slay queen for a date?